The Dufferin Islands Nature Park is located just off the Parkway south of the Falls. It is part of the Niagara Parks system. Small islands are connected by meandering paths and picturesque bridges. It’s only a couple of hundred meters from the raging torrent of the Niagara River, but it seems like another world. You may be able to spot wildlife. And, there’s free parking, which is a rare find indeed in the Falls. We hope to see you there. If you plan on coming, please complete this very brief survey. If you include your cell number, we can let you know if we have to move to the rain date, Thursday, April 18. All the details including a map showing where to meet is located here. - Fill out and mail the order form (Click here) with a cheque – note the address ! 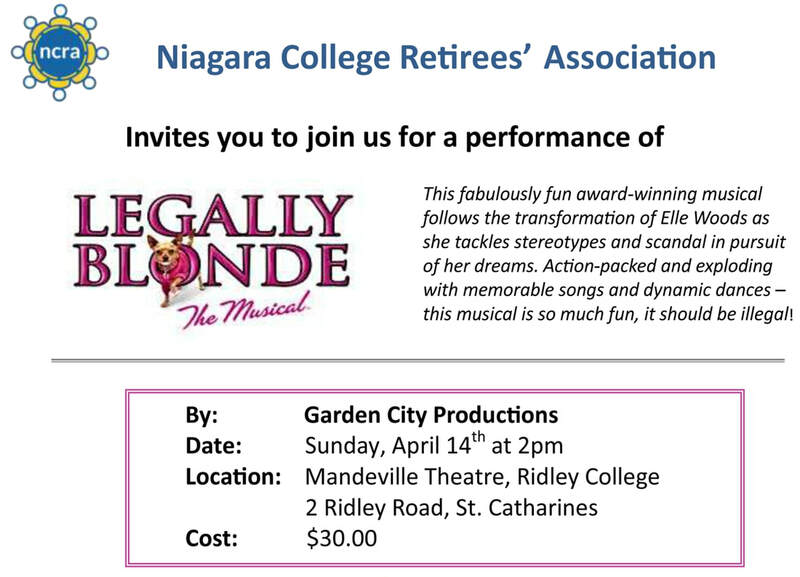 This year we will not be organizing group tickets for the Shaw Theatre; instead we invite you to join us at the above Garden City Productions' performance. If you have never attended one of Garden City's performances before, you are in for a very pleasant surprise. Their shows always receive rave reviews, and the Mandeville theatre is a very intimate (344 seats) complex, with wheelchair access and free parking for ticket holders. There isn't a bad seat in the house! Give your cheque or cash with the order form (Click here) to any NCRA executive member at any event prior to March 11th. Fill out and mail the order form (Click here) with your cheque to the address listed below. Pay online using PayPal by going to Paypal Payment below. Pay by e-transfer. 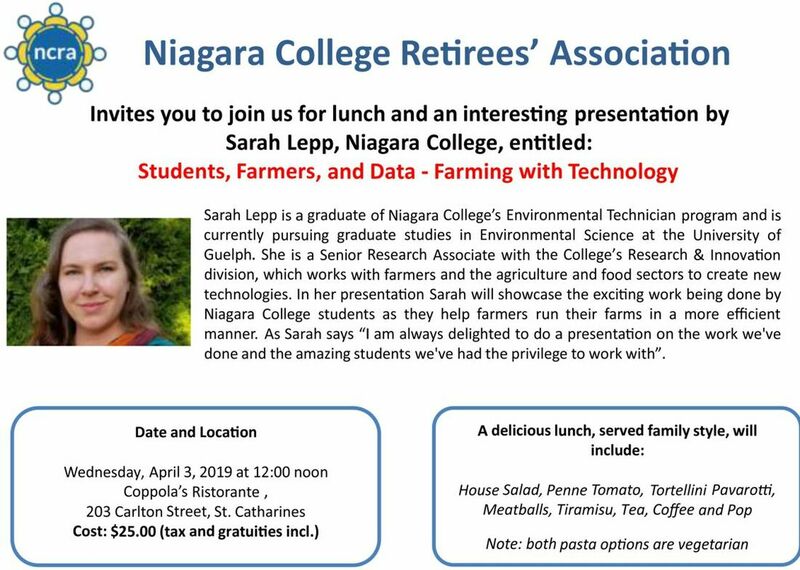 Send an email to: niagaracollege.retirees@gmail.com for instructions.